The buzz of Computex is finally wearing off, so I'll finally scribe my account of the event. YS was kind enough to go with me, we actually called it a date. The scene was quite similar to the trade shows we saw last year, however there seemed to be fewer people. This might be because we went on the final day, although we suspect there weren't that many people because there aren't "sweet" deals to be had. Regardless, there were several main "halls" filled full of stuff. The first three (two were in one building) weren't particularly interesting. I mean, there were some cool displays and lots of technology, but nothing that left me thinking "oh, that's cool" or "oh, me wanna." Until we hit the last hall. 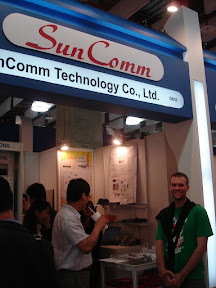 The first place we stumbled upon was the SunComm booth, which seemed to have more "traffic" than any of the other VoIP booths. Let me say this: I think VoIP stuff is awesome, that it is going to be the future, and I dig looking at demos. Even though the SunComm website pretty much looks like crap, their products are way cool. I was lucky enough to purchase a phone directly from them, and have it mailed directly to my house in Taipei (which was just around the corner from their office). They don't normally do this. 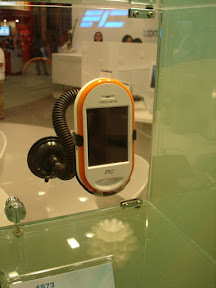 Next up was one of the main reasons I even wanted to go to Computex: to see the OpenMoko phone. To be honest with you, if I had a million dollars, this would be one of the first things I would buy. The other would be a new ThinkPad X61s. So why is this phone so cool? First off, it is based on Linux, which if you haven't gathered, I like. The entire stack is open, or nearly open. I've always purchased pretty crap phones, or been given them for free. The reason I do this is because my requirements have never been met: I want a SIP/IAX client on a wifi tri (or preferably quad) band phone. GPS is a plus, but not necessarily required. 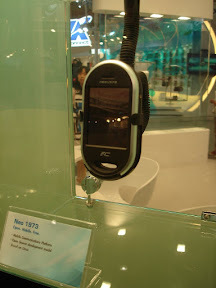 So far, I haven't been able to fine anything that has suited my needs -- the HTC Universal almost would work, apparently. The slogan is "Free Your Phone", but I think of this project more to "make your phone never become obsolete." Indeed, the hardware may become obsolete, but the software never will. I keep being reminded that this project could *really* put a dent in the future iPhone sales. I can't wait to get one with WiFi and start hacking on it -- in the meantime, I'll need to refresh my C.
Up next, directly across the aisle, was Via's new line of motherboards. At Computex there were quite a few small sets of motherboards, but nothing quite like this. 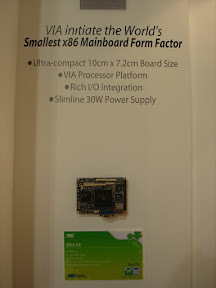 Smaller than mini-itx. Smaller than nano-itx. We have pico. This thing is freaking small. Seeing this little board made me realize my desire to minimize how much (and the size) of the technology I own. Currently I'm selling my AMD Athlong64 3000 (it has two gigs of RAM), and will at some point attempt to switch to a single laptop solution (with Xen, of course). At the same time, I'm considering how useful one of these little boards could be. Many have two NICs, which would make perfect routers. I've seen some boards for as inexpensive as $65usd.